The holiday season is a time when lots of people take to the air, flying to see relatives or go on vacation. But when it comes to seasonal travel, humans are totally outnumbered by insects. That's according to a newly published study in the journal Science, which found that more than three trillion migrating insects fly over south-central England each year. "If you were to repeat this study almost anywhere else, I guarantee that you would exceed those numbers," says Jason Chapman, an entomologist at the University of Exeter, who notes that England is relatively cold and damp. Except for standouts such as the Monarch butterfly, migrating insects have mostly been ignored by scientists who study migration, who tend to focus on charismatic birds like the Arctic tern and mammals such as the wildebeests of the Serengeti. "The insects have really not been studied in the way that they should have been," Chapman says. He points out that migrating insects can cause huge problems or bring real benefits. Consider the marmalade hoverfly, a small, insignificant-looking creature. "It's only about a centimeter long, it's orange with black stripes, but it's a hugely abundant migrant, and it actually does some very important jobs," Chapman says. This bug eats harmful aphids and pollinates crops as well as wildflowers. It spends the winter in the Mediterranean but comes to England in the spring. 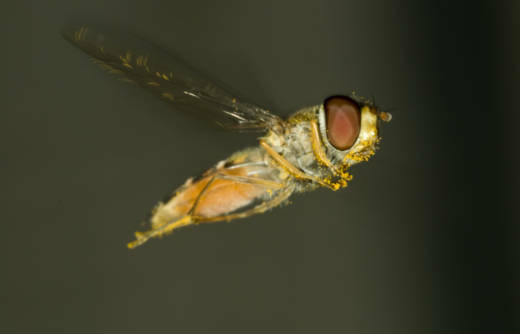 Chapman and his colleagues have spent about a decade monitoring the seasonal movement of insects like this hoverfly. They use specialized tools, including narrow beams of radar that point straight up, spotting the bigger insects that fly overhead. Smaller bugs have to be sampled using nets, which the researchers send up on little blimps. All of this lets them see which creatures fly up high, traveling with fast-moving air currents. "Those insects are the genuine long-range migrants," Chapman says. "They will be traveling at great speeds, and t raveling for hundreds of kilometers in a single flight." In addition to the sheer number of migrating bugs overhead, his team found that most migration happens during the daytime. And overall, the northward movement of insects in the spring tended to cancel out the southward movement in the fall, but in some years there could be a real excess in either direction. Chapman hopes that similar studies could be done around the globe, allowing scientists to map how insects move around the world, carrying nutrients and diseases along with them. "It's just an awfully good study, using the techniques which they have developed," says Hugh Dingle, an expert on animal migration with the University of California, Davis. He personally wasn't surprised by the magnitude of these insect migrations, but said this is something that hasn't been well understood until now. "It's nice to see the data making this so apparent," Dingle says. "Certain insects like locusts and the monarch butterfly, have gotten a great deal of attention," Dingle adds. "But perhaps because of all that attention on these big charismatic insects, the huge migrations that occur in lots and lots of other insects, all the way down to tiny aphids, are certainly not as well known by the public, and may not even be as well known by scientists."